The DocuMate 3640 is a departmental duplex flatbed scanner with a 80 page Automatic Document Feeder (ADF) that scans up to 80 images per minute (ipm) in duplex mode. 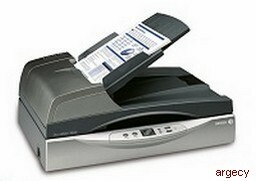 Ultrasonic Double Feed Detection insures that no pages are missed due to a misfeed or stapled document in the ADF tray. The A4 /legal flatbed is the only departmental scanner that can be programmed to automatically scan to 99 customizable applications or devices. Documents can be converted to text- searchable PDF in one easy step. The Xerox DocuMate 3640 is the perfect solution for company wide scanning solutions and enables businesses to achieve high levels of productivity by distributing fast, cost-effective departmental scanners throughout the organization.